This Military Service Page was created/owned by A3C Michael S. Bell to remember Carruth, Beverly Frisbie. Beverly passed away peacefully at home on 7-19-2010. Beverly was only of only 1,074 women who completed Army Air Force flight training and became a WASP. She entered training from Highland Park, IL as one of 103 trainees of Class 44-7. 59 young women graduated on September 8, 1944. The Big Spring Bombardier School Band played as the trainees passed in review for the graduates. Lt. Col. Roy P. Ward, the CO of the 2563rd AAFBU (Army Air Force Base Unit) was the speaker for the graduation ceremony. 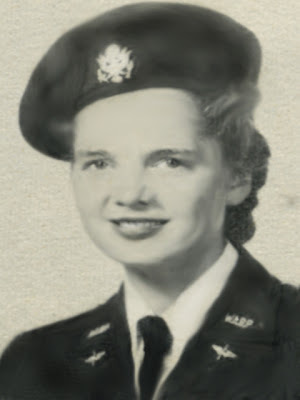 After graduation, Beverly received Army Air Force orders and was sent to Douglas Army Air Field in Douglas Arizona to the 3014th AFBU. There, she flew as a utility, administrative and engineering test pilot. Aircraft she might have flown included the BT-14, AT-8, UC-78, AT-17 and B-25. If you knew Beverly, or would like to post a message to her family, please fill out the box below. God watch over her family. Information from WASP Bryd Granger's "On Final Approach"